BLOG — Real Design, Inc.
Ryan Kieta, Real Design's Founder and Principal, is profiled in the current edition of Landscape Architecture Magazine, America's leading publication for urban design + planning! In his piece "Let My Rivers Go," journalist Zach Mortice visits Johnstown, Pennsylvania to cover Vision2025, the community's award-winning and internationally recognized urban planning and development initiative, which Kieta has been involved with since inception in 2015. Mortice narrates Johnstown's efforts to plan for its growth and development via grassroots engagement. In just three years, Vision2025 under Kieta's leadership has mobilized thousands of Johnstown residents and attracted millions of dollars in local, state, and federal investment. Mortice also writes about Kieta's perspective and involvement as a landscape architect using his design skills to facilitate a massive community planning program. "Kieta is working at the intersection of landscape design, planning, community engagement, and public-private partnerships," writes Mortice. "[He] is the rare landscape architect who's been handed the reins of a major urban redevelopment initiative - touching every facet of public life - just around his 30th birthday." We've been selected as a finalist in the Ben Franklin Technology Partners' Big Ideas Contest! Over 100 businesses applied for this contest, and only 10 were selected as finalists! We'll be pitching later this month to win up to $25,000 in investment funding for a BIG IDEA that we've been working on for awhile! Ronald Fisher of the Johnstown Tribune-Democrat interviewed our Principal Ryan Kieta about this exciting opportunity! Several of the area’s entrepreneurs have been named as finalist in the Ben Franklin Technology Partners of Central & Northern Pennsylvania’s “Big Idea” contest. The contest – which is gearedtoward entrepreneurs who have been thinking about developing or commercializing an innovative product, process or new software application – will be awarding prizes totaling up to $50,000. To be eligible for the contest, participants had to reside in one of these 12 counties: Cambria, Fulton, Indiana, Somerset, Jefferson, Blair, Bedford, Huntingdon, Centre, Juniata, Mifflin and Clearfield. • A pre-seed grant from Ben Franklin valued at up to $10,000. and development grant money from the Innovation Partnership. Ben Franklin’s Big Idea finalists include: Adam Stokes, with muonSoft (Blair County); Anthony Biddle, with Siterite (Blair County); Heather Moyer, with Crossroads Consulting (Cambria County); Ryan Kieta, with Real Design (Cambria County); Justin Capouellez, with Boomerang Beacon (Cambria County); Hunter Swisher, with Phospholutions (Centre County); James Wang, with SimplrTechnologies (Centre County); Donald Nixon, with Nixon’s Technical Service (Clearfield County); Joseph DiGangi, with Assure-Tech (Huntingdon County); and Mark Kasterko, with MT Arms (Somerset County). Capouellez said his Boomerang Beacon application will help with attracting and retaining employment in the area. “This is one of those events that promotes the positives here in town,” he said. “It’s good for young people to see that these opportunities are available. I’m excited to hear what others are working on." “We all have different ideas, but the same goal of bringing something innovative to the area,” he said. Finalists are tasked with producing a detailed business plan for their product. They also may be required to participate in training workshops before the winner is announced Nov. 16. Real Design Featured in Johnstown Magazine! This summer, we successfully coordinated a group of partners in developing a project plan and procuring resources for the installation of a cultural mural in the Cambria City neighborhood of Johnstown. As part of our work with the Vision2025 initiative in Johnstown, we organized a dozen stakeholders including Johnstown Area Heritage Association, the City of Johnstown, Friends of Cambria City, and BottleWorks Ethnic Arts Center. 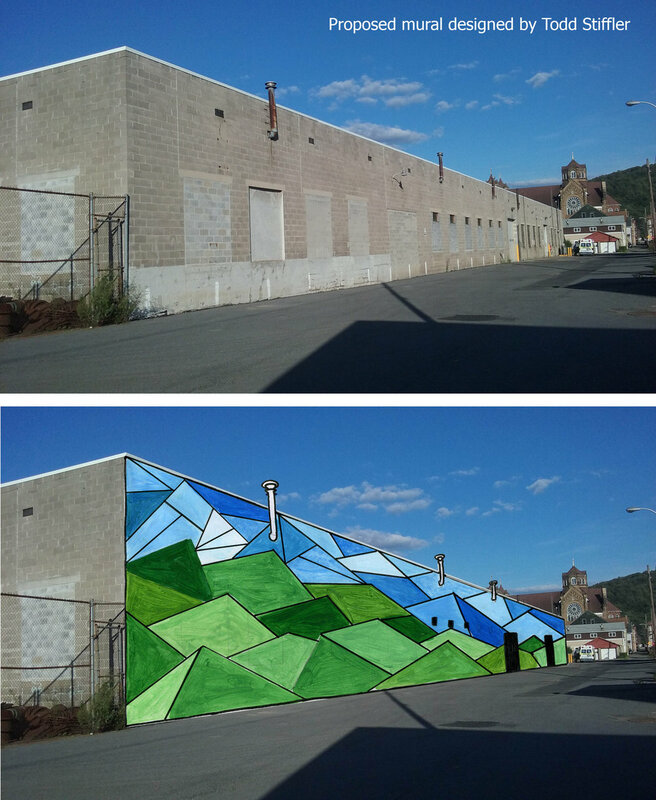 Todd Stiffler, Artistic Director at BottleWorks, designed a mural concept inspired by the hills and valleys surrounding Cambria City. The mural is envisioned as a relatively quick and easy way to brighten up a drab public structure and catalyze economic and social investment into the neighborhood. On behalf of the project partners, we wrote the proposal for this mural to Keep Pennsylvania Beautiful, who chose to fund the project. This round of funding was highly competitive with just 8 of 38 proposals from across Pennsylvania selected to receive paint and supplies. Painting will occur during Fresh Paint Days in September, with a community-wide celebration event. Free 2D CAD Figures for Architectural Renderings! This month, we're launching our latest endeavor: Land.Arch.Blog! This blog will give us an opportunity to offer design and planning resources to professionals, students, and aficionados across the world! We’ll update Land.Arch.Blog regularly with news of the firm as well as resources and goodies available for download for free! Our first freebie (available now!) is a downloadable collection of AutoCad figures that look great in architectural drawings and renderings. These figures were cobbled together by staff at Real Design over the years. They’re perfect for students and pros to quickly insert into CAD drawings and photoshop renderings. Thanks for visiting! Real Design is a fun and creative landscape architecture studio based in Johnstown, Pennsylvania. Shortly, you'll receive an email asking if you'd like to subscribe to our newsletter. We'll never spam or sell your email, but four times a year we'll send you updates of our firm and projects, opinions on current land design trends, and freebies like the one you're getting today! To download your FREE 2D AutoCAD figures, click here!